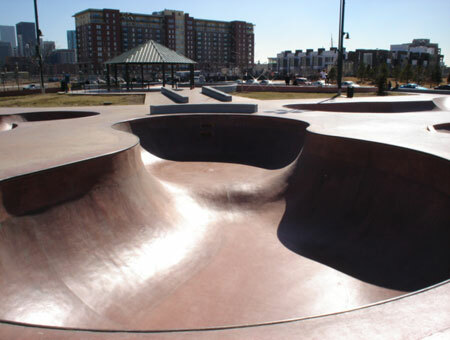 The street course area makes up the south side of the skatepark, while the entire north side of the park is bowls, from micro to a 7/10 foot kidney. Something for every skill level. To the east, is the newly opened Phase 2 section, huge banked hips surrounded by ledges and rails. 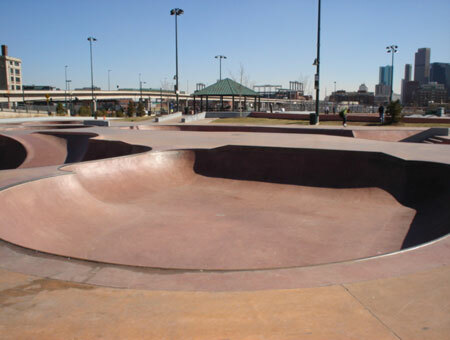 Skateboarder's paradise. Onsite bathroom and water fountain and the pavilion sports a pay phone. Cart vendors come by the Denver Skatepark occasionally with drinks and snacks so bring a few bucks. In May 2002, skaters convened at the skatepark to brainstorm ideas for the final 10,000 square feet. 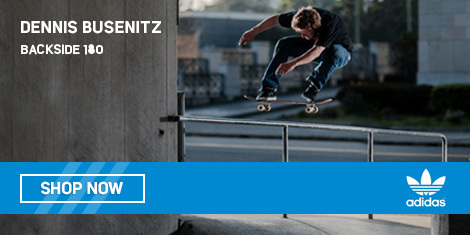 The last element is a glorified "snake run" with various platforms, ramps, rails and stairs. 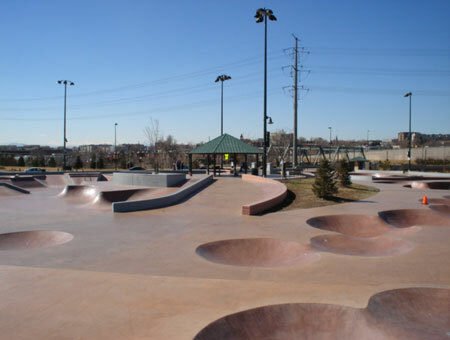 In addition to completing the skatepark's master plan, the City and County of Denver constructed a promenade to match the sandstone walls, trees and site furniture found at Commons Park along Little Raven Street. 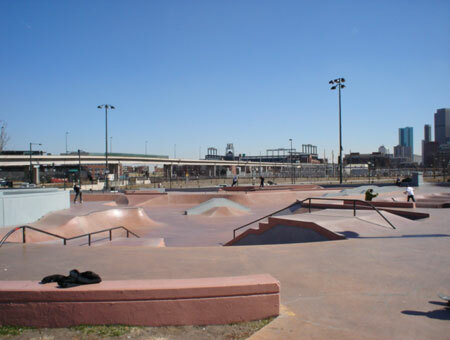 As part of Phase 2, the promenade extends from 19th to 20th Street in front of Skatepark. The skatepark is open from 5 a.m. to 11p.m.. It is unlawful for any person, other than authorized personnel, to enter or remain in this facility beyond the posted hours. WARNING: Know your ability and use this facility at your own risk. CAUTION: SLIPPERY WHEN WET. Weather and lighting conditions may cause unsafe surface conditions. Be courteous to others. Users must be under control at all times. Uncontrolled skating and other activities that endanger others will not be tolerated and will result in ejection without notice. The City and County of Denver has the right to close the facility without notice. Youth under 10 years of age must be accompanied by an adult. Permitting is required for special events. 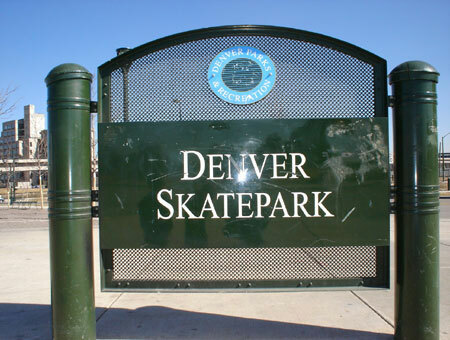 Contact Denver Parks and Recreation Permitting at (720) 913-0700. No wheels over 20" diameter permitted in the park. Modification to any element or area within the skatepark are prohibited. Mobile ramps or other skating structures of makeshift nature are prohibited. No motorized equipment is prohibited. Use of drugs, alcohol, or tobacco products is prohibited. No loud music, use of profanity, deliberately offensive conduct, or any other disturbance of peace is allowed. No glass is allowed in the skatepark. Destroying or defacing public property, including the application of stickers, or graffiti, is prohibited. Littering on public property is prohibited. Take pride in YOUR skatepark. All animals must be on a leash and kept outside of skating area. 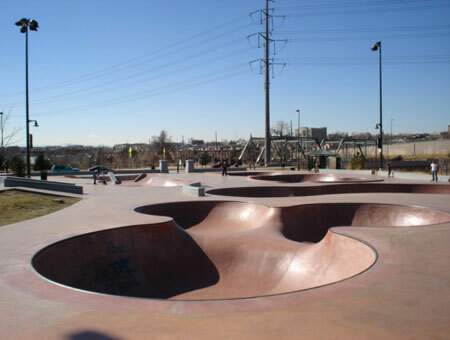 Other rules and regulations applicable tot he public's use of Denver Parks will be enforced in the skatepark.